Anti-Hairfall Shampoo has the stimulating presence of Rosemary Oil that addresses hair fall concerns. 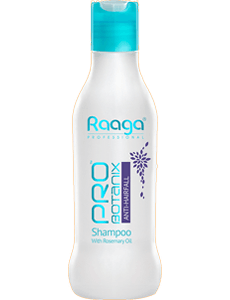 Now flaunt exuberant looking, lively hair with Raaga anti-hairfall shampoo. Also available as – Anti-Dandruff, Anti-Frizz, Color Protect, Repair and Nourish, Volume Enhance. The Anti-Hairfall Range enriched with Rosemary Oil, which is known to stimulate hair bulbs for renewed activity, helps controlling hairfall due to hair breakage. The Pre wax gel is used to prepare the skin for the wax treatment and gives a clean and soft effect. 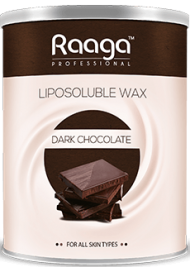 Raaga’s Liposoluble wax is an advanced depilation system. The liposoluble wax range is enriched with castor seed oil and other natural oils, which nourishes moisurizes the skin, removes the tan, slows down hair re-growth and leaves the skin feeling smooth and smelling fantastic post the waxing service. A blissful berry themed treatment that transports you to a tropical paradise with supple, nourished and silky hands and feet. The alpha-hydroxy acid and Vitamin C naturally found in strawberry work wonders to cleanse, revitalize and tone the skin.Honey bee wax remains biologically ‘alive’ even after processing and locks moisture into the skin. Available as Chocolate, Aloe Vera, Rose. Infused with Cedar Wood oil, it provides relief from anxiety and relaxes the body. The oil is well recorded in Ayurveda medicine, for its many skin benefits and has anti-fungal properties. Sesame oil improves the flow of energy and helps to remove the impurities from the body. Also available as Pain Relieving Massage Oil. Infused with Leamon Oil, a traditional antiseptic and purifier, the oils is free from harsh surfactants. It effectively removes the excess oil after a body massage when in contact with water without a need of shampoo/soap. Sunflower oil, a source of vitamin & minerals, is especially selected to nourish the skin. Almond oil, a source of Vitamin D and minerals, it leaves the skin smooth and moisturized. 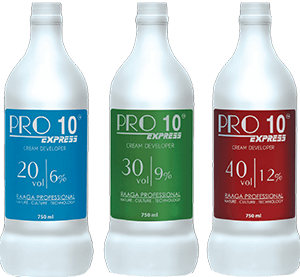 Raaga Professionals developers helps you attain the desiered hair colour by enabling all levels of lift. 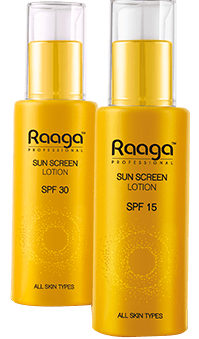 Raaga SPF 15 & 30 is formulated with proven technology and unique UVA, UVB composition, the lotion permeates into your skin right away, thereby helping to reduce free radical generation due to UV radiation. 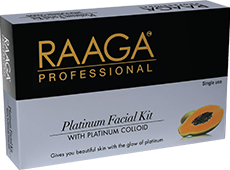 The Raaga Professional Platinum Facial is enriched with Rosemary and Papaya that gives you beautiful skin with the glow of platinum. Also available as Fairness Facial Kit, Anti-Aging Facial Kit, Gold Facial Kit, Platinum Facial Kit, Anti-Acne Facial Kit. 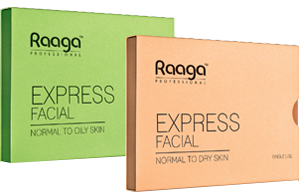 Inspired by the combination of nature’s essence and advanced technology, Raaga’s Express Facial transforms skin appearance in 6 easy steps. Also available as Eco pack. 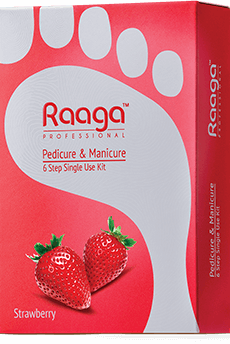 Raaga De Tan Cream is specially designed for sun tanned skin. It is enriched with scientifically extracted natural actives like milk, honey, tomato, leamon, pilberry 7 grape fruit extracts and essential oils. It is ammonia free.